Commentary: Does Salt Lake City have the water for the Northwest Quadrant? We cannot allow government agencies to commit taxpayer dollars and water rates on expansions until we have answers. 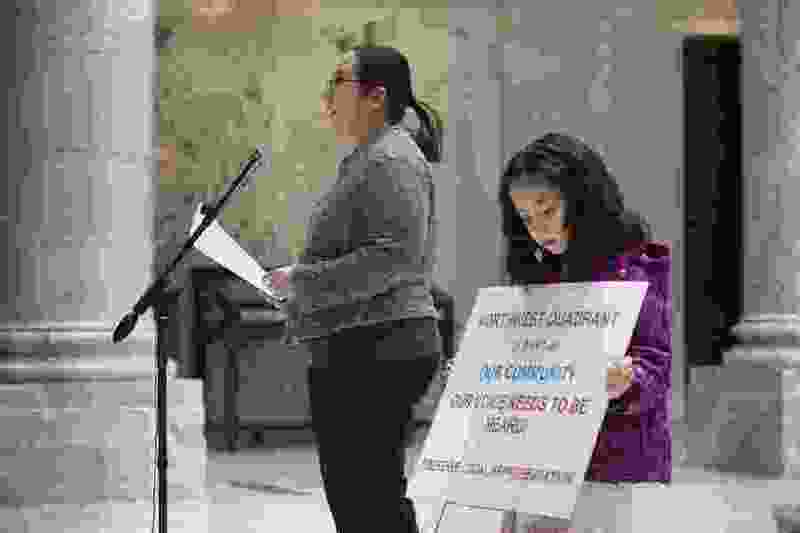 (Scott Sommerdorf | The Salt Lake Tribune) Denni Cawley speaks as her daughter Erin holds a sign as Utahns concerned about environmental health consequences and community impact from creating a state controlled inland port authority in Salt Lake City's northwest quadrant held a press conference in the capitol rotunda, Sunday, March 4, 2018. The Northwest Quadrant: Over 20,000 acres of vacant land, the future home of our state prison, a recently inked Amazon deal and the much-debated Inland Port. All of this and more, neighboring our multibillion-dollar International Airport expansion, minutes from our state Capitol and downtown Salt Lake City. Utah’s current growth, expanding at a rapid pace, provides endless opportunities for Salt Lake City’s future and the Northwest Quadrant. However, there is a decadeslong issue bubbling under the surface that can dash the grand visions of growth and development of the Northwest Quadrant. The decades-old issue is water. The governor recognized its importance and urgency when he appointed his multimember water task force. The state engineer knew this when he initiated his current adjudication process and testified before 2018 legislative committees. Rep. Kim Coleman knew this when she introduced her water data and transparency bill during the 2018 session, after informed Salt Lake City and County residents have raised their concerns, year after year. Some questions that need to be addressed include: How much water is needed to develop 20,000 acres of land within the Northwest Quadrant, and who has enough water in their inventory to meet the demand? We currently do not know the answers, yet it is not due to a lack of asking. Because the Northwest Quadrant is within the Salt Lake City municipal boundary, one first looks to Salt Lake City. However, year after year, officials of Salt Lake City have balked, ignored and left out those requesting these all-important data. It is as if the City Council, SLC Public Utilities and their lobbyists forgot that according to state statute, the “people” own the water in Utah. Fortunately, they are now coming to the table, recognizing their insufficient data and acknowledging that they do not have answers to important questions. This change in attitude should be commended, as well as those who have continued to ask appropriate questions. Open lines of communication are essential as we determine: Does Salt Lake City have enough water to continue its existing service commitments and expand? This question is at the heart of the future of the Northwest Quadrant and the quality and sustainable growth of the state. Historically, Salt Lake City has provided water to tens of thousands of residents outside its municipal boundaries, along the east bench of Salt Lake County. Most of those served have no other choice for their water provider. How does Salt Lake City assure residents they have enough water for in-city expansion? How does Salt Lake City guarantee those living in Millcreek, Cottonwood Heights and Holladay that their water service will not be terminated? We, of course, need an immediate inventory of all of Salt Lake City’s water, along with a complete review of its water agreements, contracts and obligations. Once we have an accurate inventory and have identified current and future water demand, we can then determine how much, if any, water is available for the Northwest Quadrant. The complexity of water and the basic health, safety and welfare of our citizens and those we serve require answers. We cannot allow government agencies to commit taxpayer dollars and water rates on expansions until we have answers. We need to protect our public from risks and unintended consequences. Yes, it is important to champion the cause of safe drinking water, but that is only part of our responsibility. We must also know the quantity of our water. The questions and planning before us now are enormous and we cannot adequately serve, decide and act without the accurate data to make informed decisions. Chase Winder, Salt Lake City, received his undergraduate degree in political science from the University of Utah and his MBA from Westminster College. He worked in the Washington office of Rep. Jim Matheson, co-founded an education nonprofit, and now works as a government relations executive with Qualtrics. He is a Republican candidate for the District 2 seat in the Utah Senate.